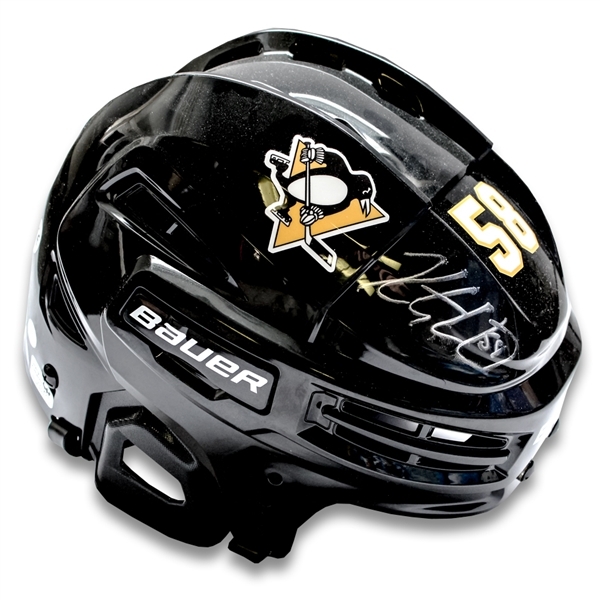 The black Bauer professional game model helmet has been personally autographed by Pittsburgh Penguins defenseman Kris Letang. This helmet features the Penguins logo on both the right and left side of the helmet, as well as the number 58 on the top centre and back of the helmet. Letang's NHL career began when he was drafted in the third round first overall in the 2005 NHL Draft by the Pittsburgh Penguins. A year after being drafted Letang made his NHL debut during the 2006-2007 season, only scoring 2 goals over the course of the 7 games he played. In the following season Letang officially had a full rookie season with the Penguins, making an impact scoring 6 goals and 11 assists for a total of 17 points in 63 games. Following his rookie season, Letang averaged more than 21 minutes per game finishing the season with 10 goals and 23 assists for a total of 33 points, first time in his NHL career reaching the double digit mark. In the same season, Letang would get his name on the Cup for the first time in his career. He would add his name two more times in 2016 and 2017. To date Letang has played in a total of 705 games scoring 101 goals and 356 assists for a total of 457 points and counting. Kris Letang is set to make his 5th All-Star appearance in 2019. This helmet is perfect for any Penguins or hockey fan. It comes complete with a Frameworth hologram and certificate of authenticity.